You can use any of these SD Memory Cards to store your photos, sound recordings created on the Nintendo 2DS™, Nintendo 3DS™ or Nintendo 3DS XL system, and music from your PC. If you plan to download full retail games to your system through the Nintendo eShop™, you may need more storage. The 8GB or 16GB SDHC SD Card provide extra storage and is better able to read and re-write large game file data than cards designed for digital cameras. While it is possible to use SD standard or SDHC standard based cards, we cannot guarantee that products other than this official SD card will work. Have a Wii™ and a Wii U™? 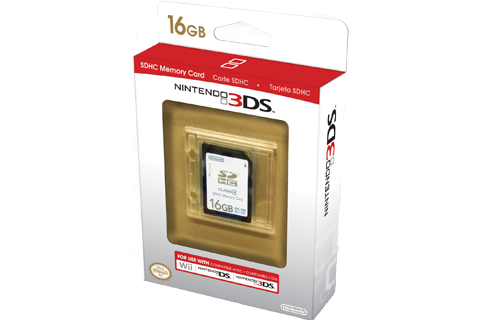 You can use the 8GB or 16GB SDHC SD Memory Card to transfer your saved game files from your Wii to your Wii U. For help with the transfer process, use our step-by-step guide. SDHC cards can also be used for saving a picture of your Mii™, QR Code patterns for your Mii, and screenshots in Super Smash Bros. for Wii U™. They cannot be used as a storage device for Wii U software downloads or save data for games.